If you have an MSDN subscription, then you have access to Windows Azure functionality at no cost. Now the level of functionality (in terms of storage, compute hours, etc) depends on the level of your MSDN subscription. But even at the lowest level, there is still enough to let you thoroughly play with the features that have been made available. Unless, that is, you’re not careful. I actually had my free subscription run out of money last month. Not because I was doing anything exceptional with it. But because I hadn’t thoroughly cleaned my toys up after I was done. So let me give you a couple of pointers on what you might need to clear up. Specifically in the area that got me…virtual machines. 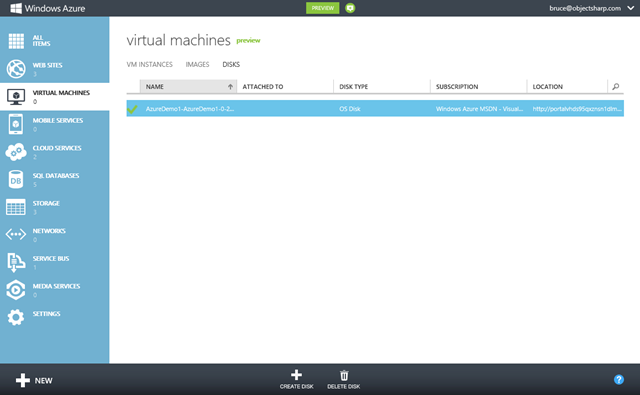 The Virtual Machines that are available in Windows Azure are sweet. You can select an image from a gallery that includes Windows Server 2008, Windows Server 2012, SQL Server 2012, BizTalk and a number of Linux distributions. Nice to work with, especially as you’re testing out the new features. But when you’re finished with the machines, deleting them does not completely clean up. Specifically, the creation of a virtual machine already creates an image of that virtual machine (the VHD file) in Azure storage. And this image continues past the deletion of the virtual machine. Taking up storage space, In my case, I had created a 1TB VM, which left 1TB of storage on my blob storage. Which ate through my 45GB/month limit very, very quickly. To clean up completely after setting up a new VM requires a few steps more than deleting the VM itself. 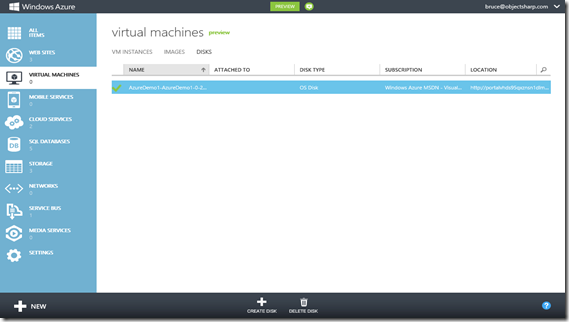 Go into the Windows Azure portal (http://manage.windowsazure.com) and get to the Virtual Machines section. Even though no virtual machines are defined (I had already deleted it), click on the Disks section. Now you’re see the OS disk related to the VM that you had created (and deleted). This is the source of the ‘offending’ storage. Once the disk is selected, click on the Delete Disk icon and Delete Associated VHD from the menu. This option removes not only the disk, but also cleans up the item kept in storage. If you hadn’t deleted the VHD, the disk would be removed, but the image would still be maintained in storage. Keeping the meter running, so to speak. While you have not gotten rid of the ‘costly’ portion of the delete VM, to complete the clean up, go back to the main Windows Azure portal and get into the Storage accounts. Then select the storage account for the VM (for me, it had a name like portalvhds95qxznsn1dlm8) and click on the Delete icon. This will completely clean up the VM. By the way, if you try to delete the storage (or any of the containers in the storage account or even the blob within the container), you will be unable to do so until the Disk is deleted. The error message if the Disk is still around is “There is currently a lease on the blob and no lease ID was specified in the request”. Not particularly clear what’s happening (as I can tell you from experience). But hopefully by including it here, the next people who run into the same message will have a better idea of how to address it. One of the joys of distributed development teams is unexpected locks. In this particular case, the file was locked by a very distributed developer. And I needed to get it unlocked, as the lock was preventing a build from running. Oh, and I was using tfspreview.com as the source control repository. In order to perform an unlock/undo, you need to know the workspace and user involved. To find out the workspace for a user, there is a workspaces option for the tf command line prompt. So open up the Visual Studio Command Line window and navigate to your local mapped directory for the project. This navigation is important, as it allows you to minimize some of the command line options that we will be using. In this case (since we’re using tfspreview.com, the domain\userid is actually the Live ID for the user that currently holds the lock. The output from this command includes the name of the workspace in question. In this case, the itemspec is the path to the locked item (for example $/MyProject/Directory/fileName.txt), the workspace is the name of the workspace identified in step 2 and domain\userid is the login id (or Live ID in our case) of the person who owns the workspace (and who has the item checked out). And voila. The lock is undone and I’m now free to wreck havoc…er…check in my code. I’m just putting the finishing touches on a book (Professional Visual Studio 2012 from Wiley) and as a result, I’ve had to learn precisely what the names of the UI formerly known as Metro would be. And you can find out the ‘answer’ in the table below, just for future reference. None of these terms roll off the tongue at all (and I’ll still get caught calling it Metro when I’m speaking). But this is the word…at least for now.